Since the ELD mandate went into effect, fleets have been scrambling to simply make sure they are in compliance with the new law. While the ELD has leveled the playing field for trucking companies, fleets now need to move on from simply using ELDs for regulatory reasons and find other ways to get the most out of ELD adoption. ELDs are tailor-made for multiple uses. Whether it be to become more productive and efficient, provide a greater level of safety or effectively migrate from an AOBRD to an ELD, fleets must be strategic on how they approach ELD adoption and usage. The fact is, the technology underpinning ELDs can provide many benefits to fleets. They can help motor carriers stay safe and competitive. Even more, they can help fleets significantly reduce operating costs. Motor carriers that focus solely on ELD compliance simply are not getting the most out of the technology they have spent a lot of time and treasure investing in. The fleets most well positioned to take advantage of the new ELD paradigm understand that robust devices can help them see greater fleet-wide fuel efficiency, higher truck driver productivity and overall engagement, and improved safety measures. Let’s look at each of these measures in greater detail. It is no great secret that fuel is the number one cost for large fleets. For most fleets fuel makes up 22 percent of total operating costs. And although fuel prices are lower than historical highs, the cost of fuel will still have a big impact on a fleet’s bottom line. As fleets move towards greater sustainability, decreased fuel usage becomes as much about lowering a carbon footprint as it is about reducing fuel consumption. Fleets have many different options to decrease fuel-related costs. Many of the most well-known methods of reducing fuel consumption include idle reduction, better route planning, and improving overall truck driver performance. ELDs can have a measured impact on each of these factors. Consider that idling burns up to one gallon of fuel per hour. One hour of idling per day equates to as much as 64,000 miles per year of engine wear. To put that in greater perspective, idling for just ten seconds waste more fuel than restarting the engine. Most fleets have no method for measuring just how much idling is occurring across their fleet. ELDs solve that problem. 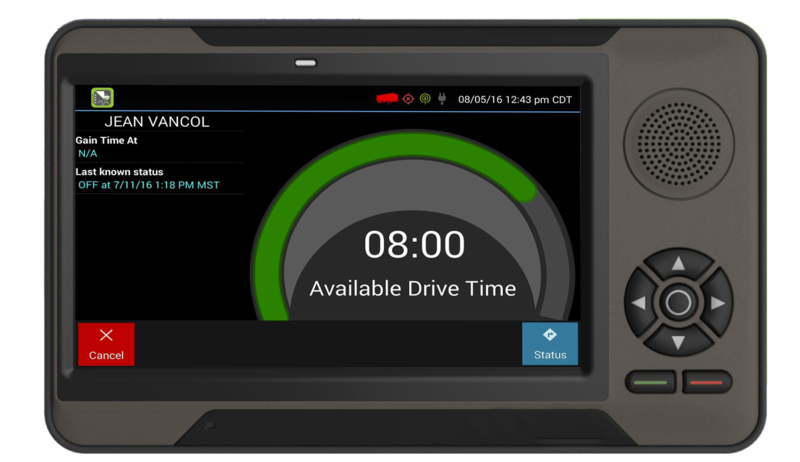 Advanced ELD solutions provide the ability to monitor idle time and transmit data to fleet managers about which truck drivers spend the most amount of time idling. Fleets can implement start/stop technologies in tandem with the watchful eye of the ELD. These systems will shut the engine off when it would otherwise be running. Integrated with telematics, these options serve as full end-to-end solutions. Improving fuel efficiency and cutting waste provides significant gains across the fleet. By learning just how much idling is taking place, fleets can coach truck drivers, utilize new technologies, and create goals and incentives to sweeten the fuel efficiency pot. Out-of-route miles represent up to 15 percent of a vehicles overall fuel consumption. That represents an unnecessary cost-per-mile of $1.59, which is no small amount. Of course, there is no way to completely prevent out-of-route miles, but better route planning can at least reduce unplanned miles and fuel expenditures. So, where does the ELD come in? Fortunately, some ELD providers offer integrated routing software. With automated routing, the ELD suggests routes for new customers, follows traffic conditions, and demonstrates a measurable impact on a truck driver’s service time. All the dispatcher or truck driver needs to do is plug in the route to see whether the current trajectory is the right one. For truck drivers that keep similar routes, sometimes the route changes based on the customer’s order. Routing software finds the best path and the lowest cost for delivery. The network can sometimes be very vast and the routes plenty. Automated routing provided through an advanced ELD solution works at computerized speed to help fleets realize new efficiencies and prevent truck drivers from spending unnecessary time on wasteful routes. It is in every fleet’s best interest to provide coaching to truck drivers on how to better save fuel. Knowing the key metrics that they should speak to, however, can be a daunting task. Advanced ELD applications will often provide data, analytics, and applications that fleets can use to measure and compare truck driver performance and behavior. Being able to measure and make use of the data provides motor carriers with a way to incentivize better performance and provide coaching opportunities for those performing at the bottom. ELD devices offer tangible ways to improve truck driver performance and thus see real improvement in everything from safety measures to fuel consumption and even truck driver morale. ELD applications provide truck driver and unit scorecards, which fleet managers can use to check on everything from over-speeding to shift patterns and so much more. By default, this leads to greater fuel optimization and improved performance. Fleet managers can identify these markers and segment the habits on an interactive dashboard, providing truck drivers with the ability to see how they are doing in real-time. The data helps root out bad driving habits and reinforce good ones. The data provided by ELDs can also be used to create better recruitment, retention and training programs, across the board. Beyond just measuring performance, ELD usage can play a big role in increasing truck driver productivity and engagement. Truck drivers of today wear many hats. Their responsibilities extend beyond truck driving, with many having to handle basic maintenance needs, data entry, and other out-of-cab tasks and regulatory requirements. While it is beneficial for any motor carrier to reduce the amount of out-of-cab activities that a truck driver must perform, they cannot always be eliminated entirely. Vehicle Inspection Reports and signature capture needs to happen outside of the cab. Still, just because these processes cannot be eliminated does not mean they cannot be made easier. ELDs can help to streamline these processes, allow for electronic vehicle inspections, signature captures, and other tasks that can eliminate unnecessary paperwork. This frees up truck drivers from unnecessary burden and increases the overall level of efficiency in fleet work. It also helps improve a truck drivers’ workflow. The fact is, anything that helps truck drivers spend more time on their core job, as opposed to completing a bunch of administrative tasks, is a value-add for fleets. Truck driver workflow is one such example. Truck driver workflow allows fleets to automate cumbersome truck driver tasks. This, in turn, helps to reduce human error and increase both fleet and truck driver productivity. Truck driver productivity is not the only unit of measurement impacted by ELD use. Vehicle productivity can also see measurable gains from ELD technology. Fleet maintenance represents another large cost for fleets. Commercial motor vehicles undergo a lot of wear-and-tear, poor roads, and bad weather conditions. ELDs can help ensure tractors stay in optimal shape when they are on the road and away for long periods of time. Fault monitoring applications can provide fleet technicians and managers with real-time notifications, and a high level of insight in the event that a fault or breakdown occurs. Fleets can then quickly diagnose and rectify problems long before they become too severe. ELD fault codes go hand-in-hand with critical event reporting, which is a tool that fleet managers can use to see if there is a risk before that risk becomes a problem. Onboard sensors give fleets quick insight into critical event reporting and provides valuable data into things like hard braking, follow time violations, abrupt lane changes, or forward collisions. Motor carriers that utilize in-cab video solutions can integrate critical reporting with their ELD. Integrated video solutions are an excellent way to document and show on-road behaviors, mitigate loss when an accident occurs, and offer effective coaching to truck drivers. Since ELDs can be combined with video and telematics technologies, fleets get far more use out of them than if they were operating them just to remain compliant. Still, compliance is important. Fleets must handle IFTA reporting and they have enough to worry about without dealing with an IFTA audit. In order to remain in compliance with IFTA record-keeping requirements, and accurately track IVMRs, fleets can rely on ELD applications. Using the ELD for these measures saves fleets both time and frustration. Motor carriers today face enough challenges. From increasing the truck driver experience to reducing waste and improving efficiency, ELDs provide themselves as a one-stop-shop technological solution. Rather than using an ELD for just one task, why not implement a solution that provides greater control and measurability over fleet operations? Fleets must look at what they want to accomplish out of ELD use beyond simple compliance. With ELDs offering a ton of different applications to help fleets increase truck driver engagement, improve fuel efficiency and operate safely, there really is no reason not to jump in head-first.